These decorative filter grilles are manufactured by Steel Crest right here in America and are made to order. Each Tuscan wall returns have a powder coated finish which is chip and scratch resistant. Decorative filter grilles are available in 8 sizes and are offered in white, black, silver or oil rubbed bronze coloring. When installing the wall return, simply fit inside the hole opening and screw mount the frame onto the wall. 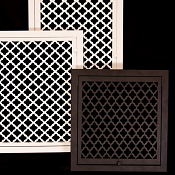 All decorative filter grille orders come with countersunk screws to match the vents finish. Choose from 3 beautiful designs for these decorative filter grilles. These filter grilles are designed to be used only on the wall or ceiling. 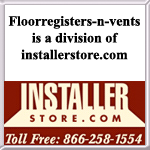 Please call us about floor filter grilles for more information. Made to last, our wall returns are constructed from 18 gauge steel and have a 1/4 inch turn back. The decorative filter grille back unit inserts 1 1/2-1 3/4 inches into the wall opening and will hold a 1 inch thick filter. This product comes with a standard, black washable filter. Wall return faceplate has a screw knob for easy access to the back unit when changing out or cleaning the filter. View available design and finish options HERE. Tip: To purchase wall returns in the correct size, be sure to measure the current opening in the wall and not an old filter grille. The 30 wide x 20 tall decorative filter grille will fit into a wall opening measuring 30 wide x 20 tall inches. All sizes are width by height, unless otherwise requested. The wall return faceplate will vary from 1 3/4 inches to 2 1/2 inches larger than the listed size for mounting purposes. Important: Basic Series decorative filter grilles are made to order and will take 2 to 4 weeks for delivery once an order has been placed. Since each wall grille is manufactured per order, this item is considered a non returnable item and cannot be canceled once payment is received. Find other decorative filter grilles collections which have many sizes and styles to choose from. Wall returns and wall registers in the Basic Series by Steel Crest are also available to order on our website. Purchase your decorative filter grille today and see how lovely the Tuscan design will look in any room.